The word “doula” (pronounced doo-luh) comes from ancient Greek and is now used to refer to “a woman experienced in childbirth who provides continuous physical, emotional and informational support to the mother before, during, and just after childbirth”. A doula does not take the place of any healthcare provider or the woman's partner. She is there solely for the mother and her partner's physical and emotional comfort. 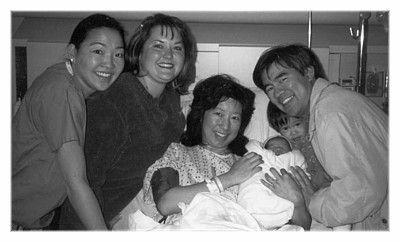 The healthcare provider and staff, the mother, her partner, and the doula work together as a team in one of the most momentous events in a woman's life. 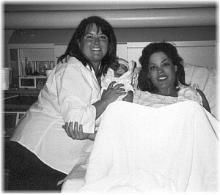 A doula is knowledgeable and experienced in the process of birth and the needs of the laboring woman. She has extensive training in techniques to use to help ease discomforts and help labor progress with the least amount of interventions. Some doulas are also childbirth educators and may offer information on exercises, nutrition, comfort measures and relaxation techniques. 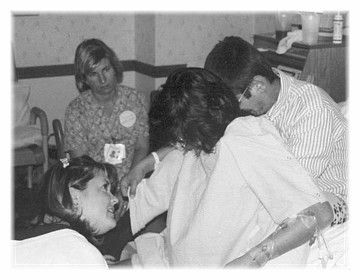 A doula meets with the parents prior to the birth to help facilitate the parent's wishes to help make this birth experience the way they would like it to be. During labor, the doulas presence allows the laboring woman to relax and feel safe while her healthcare providers monitor the birth. The doula supports the new mother and her partner in whatever way necessary, allowing the partner to participate at their own comfort level. The doula cares for the mother at home in early labor and continues to labor with her at her planned place of birth, where the doula is familiar with their policies and procedures. Whether hours or days, the doula stays throughout labor and birth. She provides continuous care and support, particularly with a lengthy labor when at the hospital nursing shifts still change every 8-12 hours. And, as sometimes happens, the mother's caregiver may have another on-call caregiver at the time of delivery, therefore the doula may be the only one source of planned care from start to finish. After the birth, the doula assists the mother with initiating breastfeeding. The doula stays for an hour or so afterwards and then gives the family some quiet bonding time together. The doula may then meet with the family again for a follow-up visit during the postpartum period. Research studies have found that when doulas attend births, labors are shorter, there are fewer complications and there is less need for oxytocin to speed labor, for forceps or vacuum extractor deliveries or for pain medications, epidurals or cesarean deliveries. Babies are also healthier and breastfeed more easily. Assists the woman and her partner in preparing for and carrying out their plans for the birth. Stays by the side of the laboring woman throughout the entire labor. Provides emotional support, physical comfort measures, and an objective viewpoint, as well as helping the woman get the information she needs to make informed decisions. Facilitates communication between the laboring woman, her partner, and clinical care providers, like the midwife, doctors, and nurses. The acceptance of doulas in maternity care is growing rapidly with the recognition of their important contribution to the improved physical outcome and emotional well being of mothers and infants. They are found in many birth settings, from the home to the hospital, and work in cooperation with physicians, nurses, midwives and the partners and families of laboring women. Mothers the mother and offers education and support to the family through the adjustment period. Can assist with light housekeeping, baby laundry, shopping and errands. Provides mommy and baby care, breastfeeding support and emotional nurturing after the birth.